Wilbur George Kurtz, who became known nationally as a Georgia artist-historian and a foremost authority on the Old South, humerously counted himself a "transplanted Yankee." Born February 28, 1882 in Oakland, Illinois, reared in Greencastle, Indiana, educated at DePauw University and the Art Institute of Chicago, Mr. Kurtz' origins and upbringing were Midwestern. As a young artist in Chicago he worked as a draftsman, engraver, professional illustrator, and specialized in architectural rendering. He first saw Atlanta in 1903, when he journeyed South to interview Andrews Raid participants. The "quiet, pleasant town, full of churches, where they rolled up the sidewalks at dark every night," captivated him. He moved to Atlanta in 1912. His home was "right next to a Civil War battlefield," and he embarked on an amazing lifelong quest for history, within a region rich with unrecorded history. 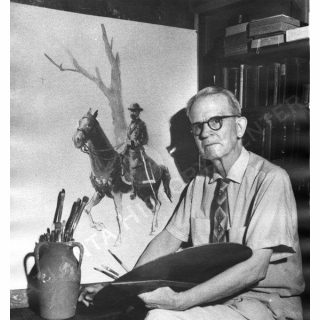 His adventures with pen, paintbrush, and sketchbook spanned the 55 years he lived in Atlanta, and earned for Wilbur Kurtz a unique place among artists, historians, and the respect and affections of fellow Georgians. 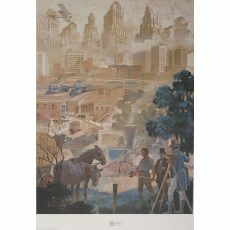 Many public buildings and private art collections throughout Atlanta and the South feature Kurtz murals and historical paintings. Mr. Kurtz became technical advisor for three notable Hollywood motion pictures which treated Georgia themes: Gone With The Wind (1939); Song of the South (1946); and Walt Disney's The Great Locomotive Chase (1957). In 1911 Wilbur G. Kurtz married Miss Annie Laurie Fuller, daughter of Captain William Allen Fuller of Atlanta. Captain Fuller was conductor on the train pulled by the locomotive General when it was captured by a band of Union soldiers dressed as civilians on the morning of April 12,1862 from Big Shanty (Kennesaw), Georgia. The incident is known to history as the Andrews' Raid or the Great Locomotive Chase. After 35 years of marriage and five children, Annie Laurie Kurtz died in 1946. In 1949 Mr. Kurtz married Miss Annie Rachel Pye, daughter of Joseph Christopher Pye of Woodland, Georgia. Mr. Kurtz passed away in Atlanta on February 18, 1967 at the age of 85.